Wow, to pin this on the Swiss seems unfair. 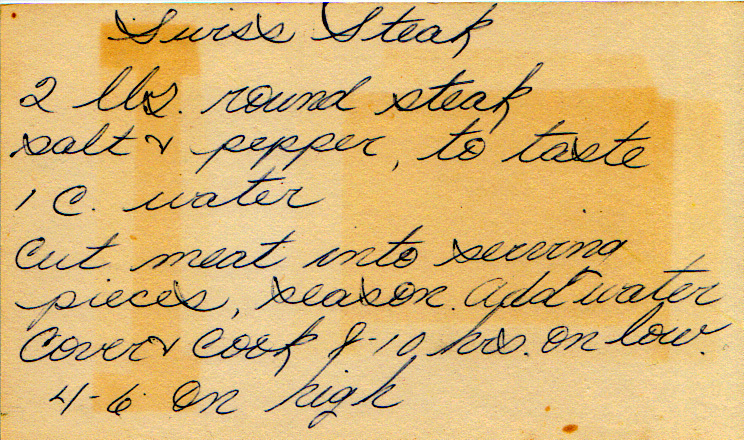 Braising barely-seasoned meat in a slow-cooker doesn’t sound like swiss steak to me. Fret not, I’ve made a much better recipe to try instead. Cut meat into serving pieces. Season. Add water. Cover and cook 8 to 10 hours on low, 4 to 6 on high. Let’s do a proper braise. Mix cornstarch, flour, thyme, salt and pepper to make a dredge. Cut the meat into slices (ideally with the grain–I know, it’s counterintuitive, force yourself). Dredge the slices in flour. Pound the sices until they’re about a quarter of an inch thick, or use one of those spring-loaded blade tenderizers they use to make cube steak until it’s a quarter of an inch thick. Dredge the meat a second time in flour. Add the onion, celery, garlic, oregano, and rosemary to the pot and stir till the onions are translucent. Then add the beef stock and tomato paste. Heat till just under a boil. Add the slices of meat back into the broth and cover. Put the pot in the oven for about two hours, until the meat is tender. A traditional Teutonic favorite for serving with sausages.